This vellum medieval manuscript dates back to circa 1440 and is believed to have been produced in Belgium, possibly Bruges. It shows a man dressed in traditional pilgrim garb with three seashell shaped badges, associated with the popular shrine of Saint James the Great at the Cathedral of Santiago de Compostela in Spain, fastened to his hat. "Pierpont Morgan Library. MS M.19, Fol. 165v." The Morgan Library & Museum. Accessed February 16, 2015. http://corsair.themorgan.org/cgi-bin/Pwebrecon.cgi?BBID=252644. 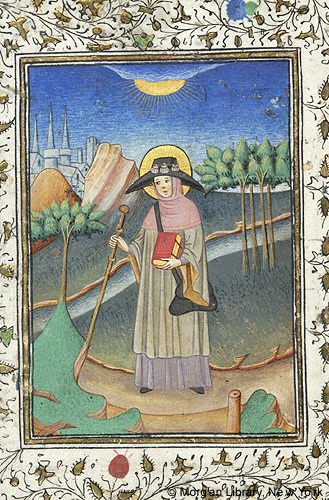 “Judocious of Brittany (detail from Pierpont Morgan Library, MS M.19, Fol. 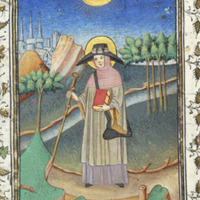 165v),” Medieval London, accessed April 22, 2019, http://medievallondon.ace.fordham.edu/items/show/110.